We've mostly had a busy and fun Christmas - hope yours was too. Christmas day wasn't the best, as we were all sick with a 24 hour tummy bug - of all the days in the year to go down with it! Still, we've postponed Christmas dinner until New Year's eve when it will hopefully taste just as good. We did manage present opening on the day which buoyed Amy up for a while and the rest of the day was spent sipping water, running to the loo (and finding someone was already in it - houses SHOULD NOT be built with only one loo!) and lying around groaning on the sofas. Once we recovered, we got together with family and caught up with the Christmas spirit. While I was staying with my Mum & Dad for a few days I rediscovered some books from my childhood that had been squirrelled away in the attic. 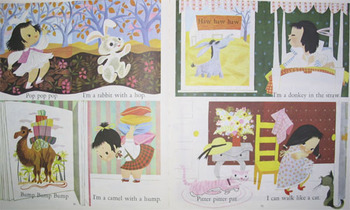 Turning the pages was like journeying back in time. 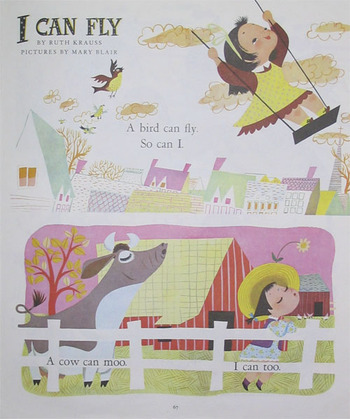 I love the illustrations and the stories are just as good today. I'll be working my way through them with Amy in our regular bedtime reading slot. 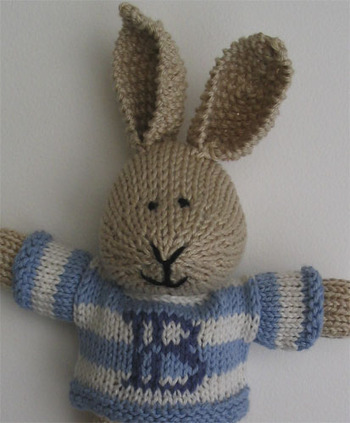 The only knitting to show so far is Billy who I finished for my friend's new nephew. I have lots of toys in progress and once the kids are back at school I'll be finishing them off and popping them in the shop - more news on them to follow. Wishing you all a fun time on New Year's Eve and a happy, peaceful and prosperous New Year. 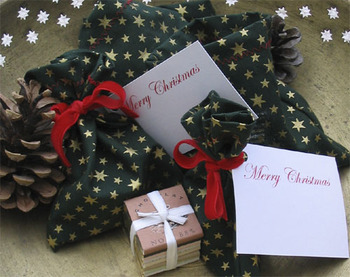 How do you find the words to really thank someone for such a spontaneous and generous gift? I feel quite overwhelmed by warm feelings of goodwill and a lovely sense of the goodness that some people have at the centre of their being. I've only been blogging since September and yet through blogging I've felt part of something special - a collection of warm, honest and creative people with big hearts and quick wits and this is embodied by Alice and her generous, beautiful gift. 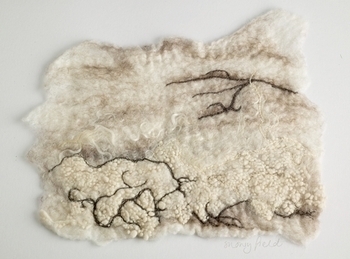 I had admired this piece greatly - it's so beautifully subtle and evocative and I'd asked about buying it. I thought that she had sold it and then today it arrived! Thank you so much Alice, whenever I look at 'Snowy Fields' I'll remember how I feel right now and know there's hope for us all and the world in which we live. Have a very Happy Christmas everyone and especially you Alice. Well, the tree is up and the little bells are doing their job of warning me when Toby starts a-climbing! This year he has a new thing too - licking all of the baubles - I think he likes looking at his tongue reflected in their surfaces and the smoothness of them! 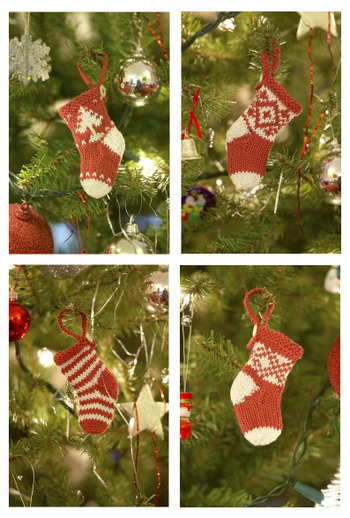 I finished 4 stockings for us, have yet to slip 4 mini tree pressies inside but at least they are hanging on the tree. We've also got a small tree for Amy where she's hung the decorations that she's collected over the last 5 years. I'm on the ball with presents for the teachers too - didn't quite get my act together to do as beautiful job as Domesticali (she and her boys made home-made treats and home-made packaging - looked great) but I did manage to make little bags and tags for some shop-bought chocs. Another thing to tick off the list! I don't know where the time has gone this week - suddenly it's nearly over and there's still so much to do - maybe I slipped into a temporal rift in the space time continuum (see, I just can't shake that star trek thing) or maybe it's just Christmas. Amy has had a busy week - becoming a Brownie, doing her school play (she remembered her lines well despite being horribly nervous, poor kid!) and the general atmosphere has upped in tempo - by the time we reach non-uniform/Christmas lunch/fun day next Tuesday my good humour may well be flagging! I've still managed to resist putting the tree up as it's a magnet for Toby who seems compelled to climb to the top! The plan is to put it up on Saturday - a balance between pleasing Amy and having to be on constant alert for Toby starting his ascent - I always hang little bells around the bottom so that I have some audible warning of an imminent assault on the north face! On a knitting note I have a box full of heads, legs bodies etc all ready for sewing up over Christmas. I'm enjoying working with some gorgeous new colours in 100% alpaca and baby cashmerino and am having fun with bears and monkeys as well as bunnies. 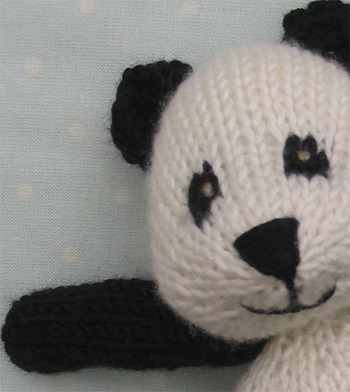 Have completed my first panda - yet to be clothed but you can have a peek here.Have a great weekend all and if you're venturing out to the shops, good luck! Heads I win, tails you loose! And no I don't mean the rippling muscle variety, although come to think about it I am pretty passionate about those too - but that's an entirely different story. 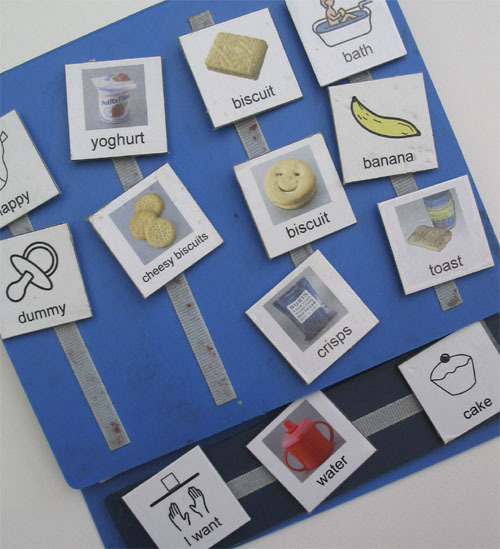 I mean the Picture Exchange Communication System which is what Toby has learnt to use so he can communicate his basic needs. One of the first indications of there being something amiss with Toby's development was that he just failed to develop speech. He'd been early to do all the physical stuff - walking at 11 months etc but though he'd been babbling all those precursors to speech like bababa, mamama and dadada he seemed stuck there and his speech just never materialised. Toby was 2 years old by the time we got the diagnosis of Autism and he still had no form of communication whatsoever. He didn't point, wave or gesture in any way in fact he didn't have any way of communicating anything. I used to guess when he was hungry, thirsty or tired and when I got it wrong life was miserable for us all. Getting a diagnosis is a battle in itself and for many families it can take over a year to get to a point where a professional is prepared to put anything definite in writing. This is an agonising time for families as there is very little support available to children without a confirmed diagnosis. Even with a diagnosis we were facing a wait of 6 months to get an initial consultation with a speech therapist to assess Toby's needs. It was time for action. Thankfully the internet is fabulous as a resource and I spent hours every evening reading all about language development, autism and various intervention methods. There is a lot out there to sift through. I looked into some of the more intensive interventions (ABA and Son-rise) but with Amy's needs to consider as well it didn't seem possible to commit the considerable time and expense that both of these entailed. PECs on the other hand was based on a simple theory that anyone with a bit of dedication and determination could put into practice. I ordered the manual, computer software and all the materials that we needed and we started as soon as they arrived. The first PECs card we ever made was for milky bar buttons and although it was slow to begin with, by Christmas Toby had 4 additional symbols that he could exchange without prompting. He's gone from strength to strength and is now able to construct very simple sentences to request food, drink, toys, dvd's and a few simple activities. If anyone out there has a non-verbal child I would encourage them to look into PECs. It's widely used in the USA and Canada and is becoming more widespread over here. It's certainly transformed life for my little boy and I can't express how thrilling it is to see him walk purposefully to his book, browse his symbols, compose his sentence and bring it to me to ask me for a custard cream and drink. Without PECs life would be a whole lot harder and more frustrating for him. For more info on PECS see here. 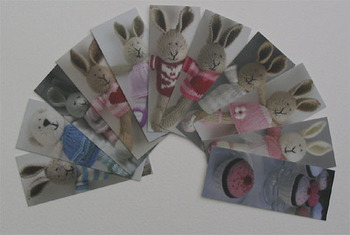 On a knitting note, my moo cards arrived - printed via my pics on flickr. I'm so pleased with them but am having difficulty parting with any at the moment! For those of you who've asked, moo cards are cute little contact cards that you can order straight off any photos that you upload to flickr. They're around 7cm long by 2.8cm wide and you can get 100 (of whichever of your photos you want - all different or all the same). You can customise the back to give your contact details and hand them out to all of your friends. It's free to open a flickr account and upload photos and the moo cards were quite cheap - around $24 per 100. 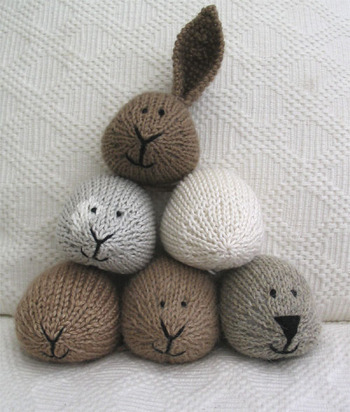 Also, for those who've kindly asked about buying my rabbits - I'm afraid that there won't be anymore for 2006. I'm planning to make as many as possible over the next month and put some into my 'shop' in the New Year. Will post glimpses between then and now and let everyone know beforehand when they'll be available - thanks so much for your interest.